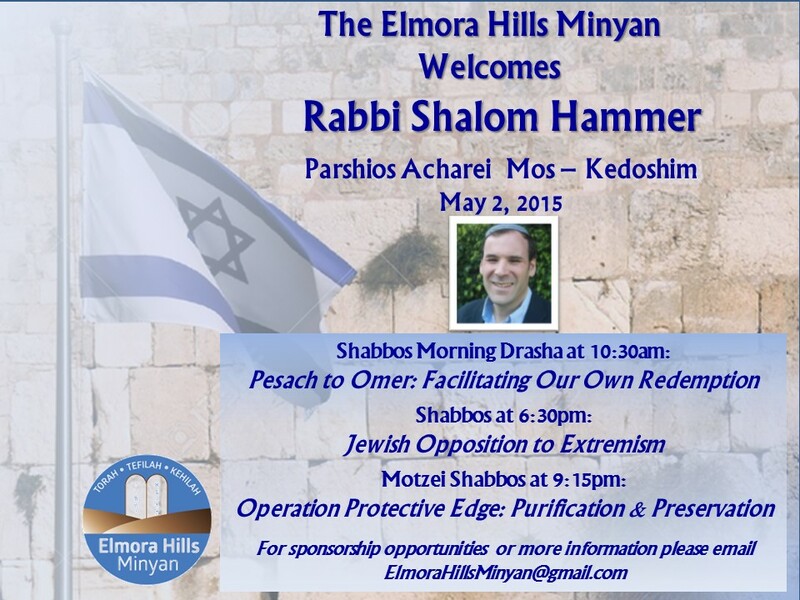 Announcements - The Elmora Hills Minyan, Inc. Please see our Facebook page for the most recent announcements. To view the announcements for Parshas Shemini click here. To view the announcements for Parshas Ki Sisa please click here. To view the announcements for Parshas Mishpatim please click here. To view the announcements for Parshas Yisro please click here. To view the announcements for Parshas Beshalach please click here. To view the announcements for Parshas Bo please click here. To view the announcements for Parshas Miketz please click here. To view the announcements for Parshas Vayishlach please click here. To view the announcements for Parshas Vayeitzei, please click here. To view the announcements for Parshas Toldos, please click here. To view the announcements for Parshas Chayei Sarah, please click here. To view the announcements for Parshas Vayera, please click here. To view the announcements for Parshas Lech Lecha please click here. To view the announcements for Parshas Noach please click here. To view the announcements for Parshas Bereishis please click here. To view the announcements for Shabbos Chol HaMoed, Shemini Atzeres and Simchas Torah 5777 please click here. To view the announcements for Parshas Ha'azinu and Sukkos 5777 please click here. To view the announcements for Parshas Eikev please click here. To view the announcements for Parshas Va'eschanan please click here. To view the announcements for Parshios Matos Masei please click here. To view the announcements for Parshas Pinchas please click here. To view the announcements for Parshas Balak please click here. To view the announcements for Parshas Naso please click here. To view the announcements for Parshas Bamidbar and Shavuos please click here. To view the announcements for Parshas Bechukosai please click here. To view the announcements for Parshas Behar please click here. To view the announcements for Parshas Kedoshim please click here. To view the announcements for Parshas Acharei Mos please click here. To view the announcements for Parshas Metzora please click here. To view the announcements for Parshas Tazria please click here. To view the announcements for Parshas Shemini please click here. To view the announcements for Parshas Pekudei please click here. To view the announcements for Parshas Bo, please click here. To view the announcements for Parshas Va'era, please click here. To view the announcements for Parshas Shemos, please click here. To view the announcements for Parshas Vayechi, please click here. To view the announcements for Parshas Vayigash, please click here. To view the announcements for Parshas Mikeitz, please click here. To view the announcements for Parshas Vayeshev, please click here. To view the announcements for Parshas Vayishlach, please click here. To view the announcements for Parshas Lech Lecha, please click here. To view the announcements for Parshas Noach, please click here. To view the announcements for Parshas Bereishis, please click here. To view the announcements for Shabbos Chol HaMoed Sukkos, Shemini Atzeres and Simchas Torah, please click here. To view the announcements for Parshas Ha'azinu and the 1st day of Sukkos, please click here. To view the announcements for Parshas Vayelech, Shabbos Shuva, please click here. To view the announcements for Parshas Nitzavim, please click here. To view the announcements for Parshas Ki Savo, please click here. To view the announcements for Parshas Ki Seitzei, please click here. To view the announcements for Parshas Shoftim, please click here. To view the announcements for Parshas Devarim, please click here. To view the announcements for Parshios Matos-Masei, please click here. To view the announcements for Parshas Pinchas, please click here. To view the announcements for Parshas Balak, please click here. To view a summary of the halachos of the three weeks and nine days, please click here. To view the announcements for Parshas Chukas, please click here. To view the announcements for Parshas Korach, please click here. To view the announcements for Parshas Shelach, please click here. To view the announcements for Parshas Beha'alosecha, please click here. To view the announcements for Parshas Naso, please click here. To view the schedule for Parshas Bamidbar and Shavuos, please click here. To view the announcements for Parshios Behar-Bechukosai 5775, please click here. To view the announcements for Parshas Emor 5775, please click here. 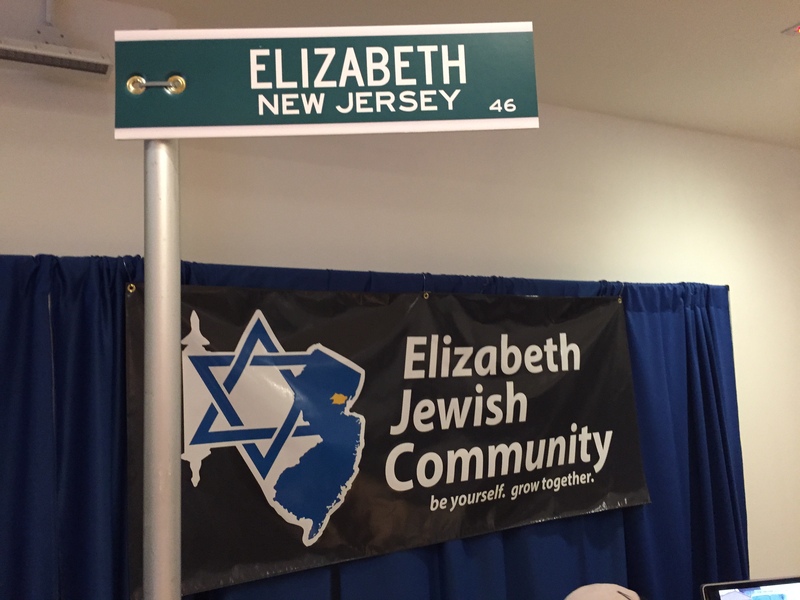 The week began with our participation, along with our friends and neighbors at the JEC Elmora Avenue Shul, in the OU Jewish Communities Fair this past Sunday (see below for a photo of our community logo) where we proudly presented the Elizabeth Jewish Community to dozens of prospective families. Over the past few days we have spoken with many couples who are interested in visiting for Shabbos so that they can see firsthand what living here would be like for them and their families. If you know of any families that are looking to relocate and are considering our community, please let me know, we’d be happy to invite them and host them for a Shabbos. As we move to the next step of our outreach efforts, we need families who are willing to volunteer to provide exceptional hospitality for visiting families for sleeping and meals. We will make every effort to match the compatibility of the guests with host families. As this is a joint outreach effort for the continued growth and success of our community, all visiting families will be introduced to both the Elmora Hills Minyan and the JEC Elmora Avenue Shul over the course of Shabbos. We encourage you to sign up and indicate how many bedrooms you have, how many guests you can host and the number and ages of children you have as well an any other important information we and/or guests should know (i.e., you have pets). The more volunteers we have, the easier it will be to provide for the many guests we hope to host in the weeks ahead. Thank you to the dozens of members who Voted Torah to support Torah programming in Israel and throughout the world. Our shul qualified for several entries in the OU’s raffle to win up to $15,000. A huge yasher koach to our security committee, including Shlomo Blashka, Tzvi and Yehudit Schlissel and Josh and Naomi Stroock for preparing and submitting our shul’s application for a federal Department of Homeland Security grant earlier this week. The application process is an arduous and tedious one and their dedication and diligence in collecting all the data and submitting the application within just a few weeks is an impressive reflection of what our shul can accomplish with the diligent support of our members. We are still collecting funds from our Pesach appeal to upgrade our shul's security; please contribute as soon as possible (click here to donate online) so that we can budget accordingly. The weather looks absolutely perfect for a terrific Shabbos featuring our Scholar-in-Residence, Rabbi Shalom Hammer. Rabbi Hammer was very well received by the students of JEC when he spoke at their program on Yom Ha’Atzmaut last week and many community members are looking forward to putting a face with the rabbi whose books they already enjoy. This Shabbos is your opportunity to hear him in person for yourself! Rabbi Hammer has lived in Israel for over 25 years. He served in the Rabbinate Division of the Israeli Defense Forces and currently serves as a lecturer for the IDF to help motivate troops in all divisions and infuse Jewish Identity. Previously, he served as a Ra"M in the Yeshivat Hesder Kiryat Gat affiliated with Sderot. Rabbi Hammer is currently involved in his own initiative offering lectures throughout the country on the basics of Judaism to many secular kibbutzim and moshavim. Mazal tov to Abby Savitt upon her bat mitzvah. Mazal tov to proud parents, Jessica & David Savitt, and her siblings, Jacob and Gavi. Mazal tov as well to her proud grandparents, Sue & Art Weinstein. This erev Shabbos, Parshios Acharei Mos-Kedoshim, neiros should be lit by 7:34pm, though we’ll be davening mincha at 7:00pm. Rabbi Hammer will deliver the Shabbos morning drasha at approximately 10:30 entitled, "Pesach to Omer: Facilitating Our Own Redemption." Early mincha will begin at 6pm, followed by Rabbi Hammer’s shiur at 6:30 entitled, “Jewish Opposition to Extremism." Late Mincha will begin at 7:20 followed by shalosh seudos during which we will conclude the 4th perek of Maseches Brachos and grapple with another great halachic question posed to Rav Yitzchak Zilberstein. Maariv will begin and Shabbos will end at 8:44. 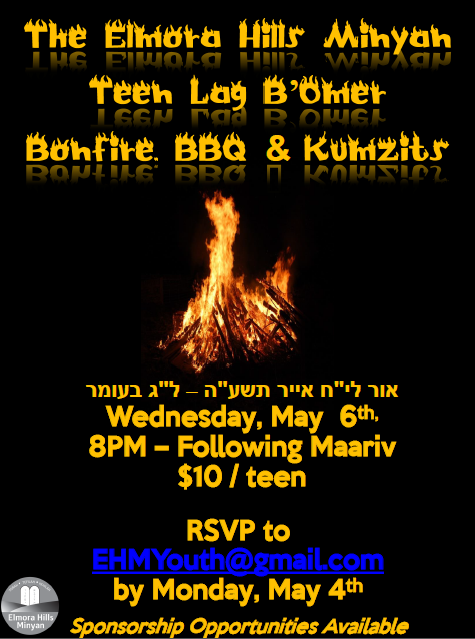 Lag B’Omer: All teens are invited to the Elmora Hills Minyan's Lag B'Omer BBQ, Bonfire and Kumzits this Wednesday night, May 6th, at 8pm. Admission is $10 per teen, and we encourage sponsorships to help defray our costs. Please email EHMYouth@gmail.com by Monday, May 4th to reserve your seat around the fire! If you or a relative are interested in giving a shiur over Shavuos, please contact me. It was also great to see so many familiar faces at the Union Y last night for the communal Yom HaZikaron/Yom Ha’Atzmaut event, I was honored to have been invited to share divrei Torah during the program. Yet the celebration of the State of Israel entering its 68th year was muted somewhat, at least internally, by the loss earlier this week of HaRav Aharon Lichtenstein zt”l. Rav Lichtenstein served for decades as Rosh Yeshiva of Yeshivat Har Etzion and Rosh Yeshiva and Rosh Kollel at Yeshiva University’s Gruss Campus in Israel who knew much if not most of the Yam Shel Torah and was renowned as gaon of lomdus, middos and mussar, and someone whose insights on matters of communal policy were sought by rabbanim, askanim and balabatim alike. His petirah leaves a vacuum of Torah, hasmada and leadership for all of Klal Yisrael. I look forward to sharing some of his divrei Torah with you over Shabbos. This erev Shabbos, Parshios Tazria-Metzora, neiros should be lit by 7:27pm, though we’ll be davening mincha at 7:00pm. Sponsorship of tomorrow’s Kiddush is still available; if you’re interested, please reply to this message. Early mincha will begin at 6pm, followed by my shiur at 6:30 l’iluy nishmas HaRav Aharon ben R’ Yechiel, Rav Aharon Lichtenstein zt”l, entitled: The Responsibilities of a Jew in the eyes of Rav Aharon Lichtenstein zt”l. Late Mincha will begin at 7:15 followed by shalosh seudos during which we will continue our learning of the 4th perek of Maseches Brachos with the 6th mishna and grapple with another great halachic question posed to Rav Yitzchak Zilberstein. Maariv will begin and Shabbos will end at 8:31. A group of us will be joining other friends in the community in proudly representing the Elizabeth Jewish community at the OU’s 5th Communities Fair in Manhattan on Sunday. Many hours of work have gone in to making sure that the expected crowd of 2,000 participants finds Elizabeth an attractive place to live; we look forward to hosting some of them in the weeks and months ahead. If you know of any families that are looking to relocate and are considering our community, please let me know, we’d be happy to invite them and host them for a Shabbos. Next Shabbos: EHM welcomes Rabbi Shalom Hammer as our scholar-in-residence on Shabbos Parshios Acharei Mos-Kedoshim, May 2nd. Rabbi Hammer will be delivering a Shabbos morning drasha, a shiur before mincha and will offer a multimedia presentation at our Motzei Shabbos melava malka. Please refer to the attached flyer for more information. To sponsor this special Shabbos, please reply to this email or contact Rabbi Bleicher or Steve Schnipper. May 6: All youth are invited to a Lag B’Omer bbq and kumzits at the shul on Leil Lag B’Omer, Wednesday, May 6th, following maariv. Further details to come. April 30th is the deadline to Vote Torah! Vote for the Torah slate in the upcoming World Zionist Congress elections and help ensure that funding is channeled to programs like students attending yeshivos and seminaries in Israel, infrastructure budgets for communities in Gush Etzion and Jersualem, religious Zionist youth movements, budgets for shlichim in Jewish communities worldwide and additional Orthodox seats (and their voices at the stakeholders table) on boards of funding organizations. If that’s not enough to motivate you to vote, this might: If you vote and share your voter number with us, we will be entered into a raffle of shuls to receive up to $15,000 from the OU. To vote online, click this link:www.votetorah.org. We’ll also have ballots available at our event on Wednesdaynight. Help Israel, help World Jewry and help support the Elmora Hills Minyan! If you voted following the program on Wednesday night but did not yet submit your voter code, please forward that email to me so that we can get as many entries into the raffle as possible. We look forward to welcoming back our members and friends who were away for Pesach. Yasher koach to everyone who made the last days of Pesach so special, especially those who stepped up to fill in for volunteers who were away for Yom Tov. From the first maariv two weeks ago through the neilas hachag last week, Zman Cheiruseinu was one that had a tremendous impact on me personally, and I hope on the rest of you as well. L’shana haba’ah b’Yerushalayim! With the warm weather of spring now upon us, please be sure to recite Birchas HaIlanos at your earliest convenience. Thanks to the JEC for organizing a helpful list of the location of fruit trees in our neighborhood, which is accessible here. Mazal tov to Roberta Wahrman on the recent marriage of her grandson, Ari Ginsberg, son of Elise and Zvi Ginsberg, to Alyssa Zaretsky. May they be zoche to build a bayis ne’eman b’Yisrael! This erev Shabbos, Parshas Shemini Mevorchim Iyar, neiros should be lit by7:20pm, though we’ll be davening mincha at 7:00pm. Please join me at 6:20 Shabbos afternoon as we learn l’iluy nishmas those who were murdered during the Holocaust in a shiur entitled: Holy Questions from the Ashes of the Holocaust. Mincha will begin at 7:05 followed by shalosh seudos during which we will continue our learning of the 4th perek of Maseches Brachos with the 5thmishna and grapple with another great halachic question posed to Rav Yitzchak Zilberstein. Maariv and Rosh Chodesh Iyar will begin and Shabbos will end at 8:24. Rosh Chodesh Iyar is Sunday and Monday. Pending the conclusion of the 8am shachris on Sunday morning, the 9am shachris minyan will begin in the youth room and then switch places with mishnayos and breakfast. May 2: EHM welcomes Rabbi Shalom Hammer as our scholar-in-residence Shabbos Parshios Acharei Mos-Kedoshim, May 2nd. Rabbi Hammer will be delivering a Shabbos morning drasha, a shiur before mincha and will offer a multimedia presentation at our Motzei Shabbos melava malka. Please refer to the attached flyer for more information. To sponsor this special Shabbos, please reply to this email or contact Rabbi Bleicher or Steve Schnipper. April 30th is the deadline to Vote Torah! Vote for the Torah slate in the upcoming World Zionist Congress elections and help ensure that funding is channeled to programs like students attending yeshivos and seminaries in Israel, infrastructure budgets for communities in Gush Etzion and Jersualem, religious Zionist youth movements, budgets for shlichim in Jewish communities worldwide and additional Orthodox seats (and their voices at the stakeholders table) on boards of funding organizations. If that’s not enough to motivate you to vote, this might: If you vote and share your voter number with us, we will be entered into a raffle of shuls to receive up to $15,000 from the OU. To vote online, click this link: www.votetorah.org. We’ll also have ballots available at our event on Wednesday night. Help Israel, help World Jewry and help support the Elmora Hills Minyan! The Union Y invites the community to its Yom Hazikaron-Yom Ha’atzmaut program at the Y this Thursday evening, April 23, at 5:30, featuring the Maccabeats.